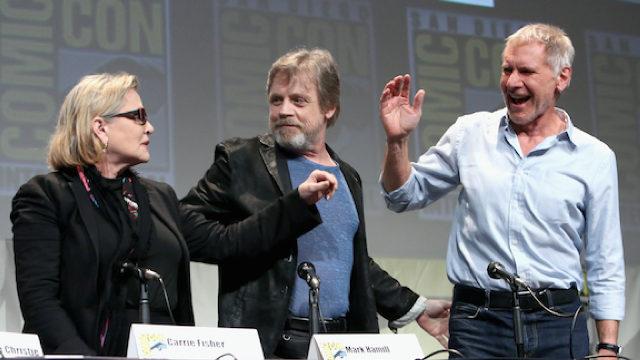 Carrie Fisher, Mark Hamill and Harrison Ford at SDCC 2015. This entry was posted in Like Show Business and tagged Archer, Batman, San Diego Comic-Con, Star Wars, Superman by Mike Glyer. Bookmark the permalink. That Batman vs. Superman trailer is a mess. It just occurred to me that the way Snyder appears to have structured the plot, Batman is the guy who goes along with the crowd. Lots of people are leery of Superman, especially the Powers That Be. So Batman is leery of Superman too. That’s…maybe not the way you wanted to go there. Have I lost my marbles, or is the plot of that … the super-intelligent Superman and super-genius-detective Batman fall for Lex “Brainiac” Luthor’s (who is acting like … the Joker?) “Let’s You and Him Fight” scam. Per always, Archer is the best. Every second of that was gold. and look at all the women on the mission team! 1) The Fight with Zod and Superman. 2) Bruce Wayne runs towards a collapsing skycraper. 5) Which leads us to hear how fear and anger turn good men cruel, and finally images of Batman’s vigilante terror. This might not be the Batman we are familiar with. For example, he could have had family that he lost and how he has become Batman at a much older age than usual. If we look at the devastation of Wayne Tower with the dozens dead. (Dozens: An indefinite, large number.) The tower was most likely the headquarters of Wayne Financial, which begs forth the question: how easy do you think it is to resume operations as usual if you have lost your headquarters and dozens of key employees? Not to mention how the fight between Superman and the Kryptonians was a disaster on a global scale, and the sheer volume of rebuilding implies that not everything will be financed. So imagine what happens when Wayne Financial chooses not to finance any particular rebuilding initiative. A decision that will touch lives, and there we find the reason why someone would want to sent Bruce Wayne that newspaper clipping. A setting where it almost makes sense for a super rich to wear a mask and spend his nights punching street level criminals. So, no. I do not think Batman is going along with the crowd. If anything, there is the potential to make Batman’s fight with Superman very personal. Lex Luthor possesses genius level intellect, something that is also attributed to Batman, and even to Superman at times. Reboots make it bit difficult to follow what Superman’s exact powers are, for example, I hear that he can nowadays explode into some manner of solar flare and being powerless. The first season will be based on The Elfstones of Shanarra. A Star Wars with tons of practical effects? That was much better than I expected. I’m cautiously optimistic about this film. 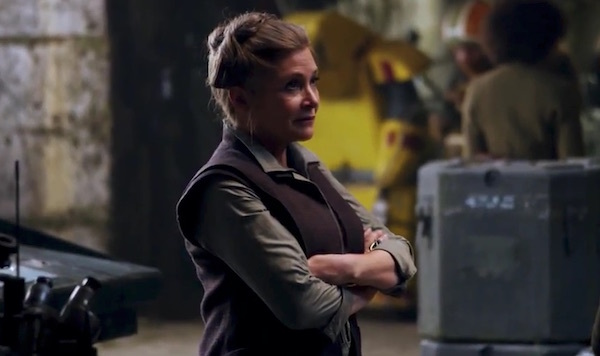 The Star Wars trailer looks amazing! All the swipes at Lucas and his CGI obsessions made me snicker. Am I the only one who watched the Vikings trailer? GOOSEBUMPS! The Vikings trailer confused me. It’s supposed to be the History channel, but Where are all the UFO Nazi ancient astronauts? Huh, The Man from U.N.C.L.E trailer actually looks pretty good. I’m not sure its got the humour or charm of the original nailed, but its not bad. I watched the Vikings trailer, but since I haven’t watched series 1-3 I’m not sure it had the intended impact. I spent most of it trying to figure out who was on who’s side. And the Man from U.N.C.L.E. just keeps… look, in the original series, Solo and Kuryakin just worked together. It was RARE for their countries of origin to be raised at all. And this was DURING the Cold War, when the choice was deliberate and significant. But its significance was if anything highlighted by not making a deal of it, not by constantly saying “oh, look, a Russian and an American work together. Do you get it? Do you?”. And they just didn’t need an “origin story” or a meet cute. I liked that they were established with the origin story taken as read. That’s true. It would have been nice to have kept that aspect, not just because it makes an important point, but because every damn team up these days seems to require that conflict, like having an enemy isn’t enough, the good guys can’t get along either. Its a bit overdone. Seriously though, the maze of alliances, collapsed alliances, loyalty and disloyalty are too tangled to explain. I’ve got a real soft spot for the show – some of the history is definitely “ehhhh… maybe,” but the performances, costumes and sets are fantastic. I’m resisting the hype. I adored how Michael Rosenbaum portrayed the pre-Superman Lex Luthor in “Smallville,” so I’m mostly interested in seeing what Jesse Eisenberg does with the character. Even so, I’ll wait to see what reviews say. I have, uh, issues with Zack Snyder’s approach to superhero films, so I’m not expecting to enjoy it or even watch it until its veeery very cheap or on one of the main streaming services. I’m kind of digging the religious leader with a few screws loose vibe to Eisenberg’s portrayal, but I’m not sure it will hold up for an entire film.
. I’ve got a real soft spot for the show – some of the history is definitely “ehhhh… maybe,” but the performances, costumes and sets are fantastic. I’d say some of the history is more like “yeeaahh…no”, but then I remember the Tudors with the (bewildering) fake Portuguese marriage subplot, and Vikings is okay. I just watched all of the trailers back to back, and was shocked to find myself much more excited about Lagertha & co. than about Star Wars, even with the promise of less/better CGI. Huge, irrational soft spot here. I think it’s the characters, who manage to somehow be real (if exaggerated) people I really really like (well, except Bjorn, but he’s getting to love-to-hate levels, which also works). It’s a crazy, silly, sometimes infuriating show: those twists and turns can be a bit much and/or predictable; the thing they do with languages is just …, and there are odd anachronistic touches, like when they refer to themselves as “medieval”. But it’s crazy fun and compelling. Also: Lagertha.